Hello everyone! 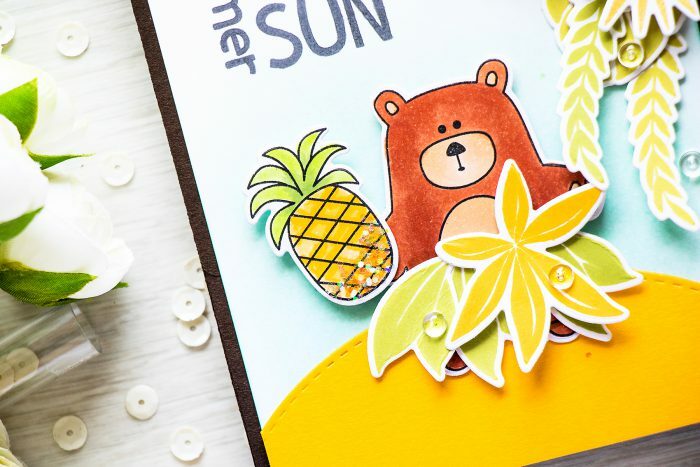 When I first stamped a few images from the Tropical Leaves stamp set from Simon Says Stamp and saw the cute little bear from the Summertime Animals set I immediately wanted to create a skirt for him out of tropical leaves. This might sound a bit weird lol, I bet it sounds a lot weird, but I had that idea in my head and I just needed to re-create it on paper. I’m loving the result and hope you’ll love it too! I filmed a video tutorial where I share the process of how this card came together. Watch it here or on my Youtube channel. I started by stamping the bear and pineapple in Simon’s Intense Black ink onto Copic-friendly paper. Both images were colored with Copic markers, but I only did flat one-shade coloring (I should have done a better job in terms of coloring the bear, but every time I try to add shading I just mess things up). Like I mentioned, I wanted to have a tropical bear and I wanted to cover his underpants up with tropical leaves. I intentionally didn’t color that part of the image, the underpants, instead I extended the brown color from his feet up so no white would show through. 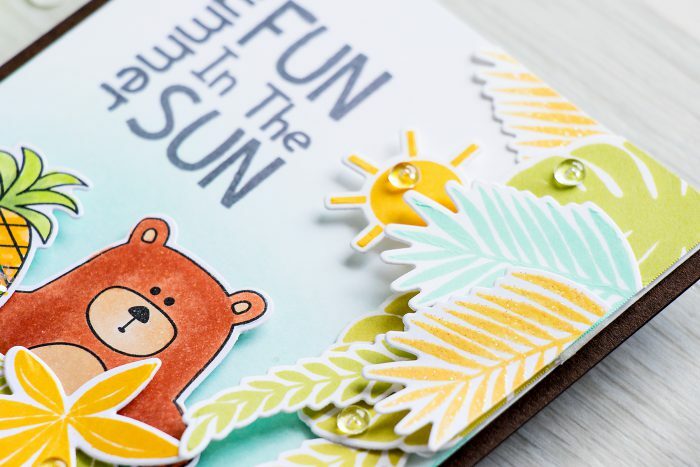 To create the tropical skirt I used images from the Tropical Leaves stamp set and stamped the smallest leaf 3 times using Willow and also a large leaf using Sunshine. 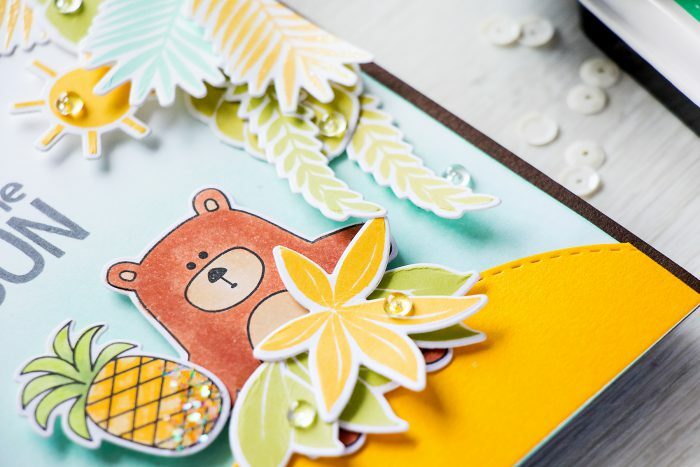 I also did a lot of additional stamping – I wanted to create a palm tree or an illusion of lush tropical vegetation on this card, so I stamped a bunch more leaves using Catkin, Willow, Mint Candy and Duckling. 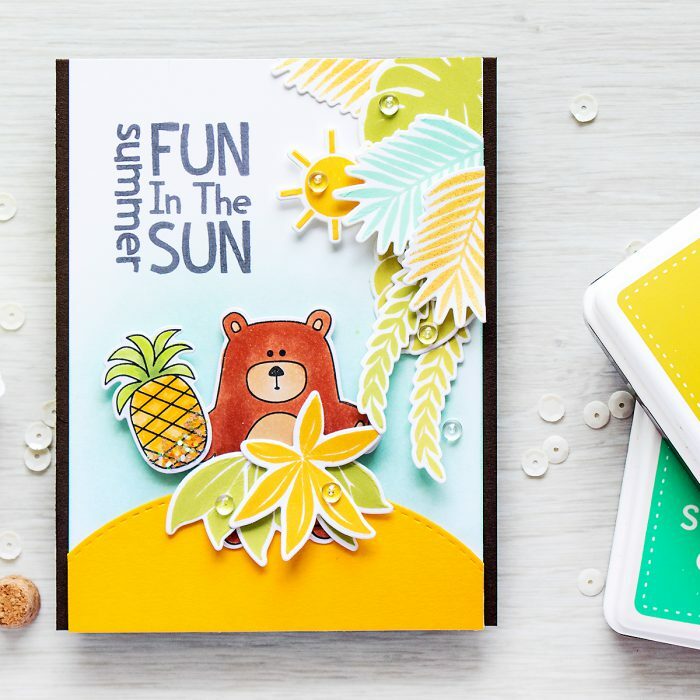 To create the scene, and by the scene I mean the island I used Simon’s Stitched Ovals die set and die cut the largest out of Sunshine cardstock, that created a perfect hill for my bear to stand on. I blended Mint Candy ink onto a panel of white cardstock to create ocean and sky. 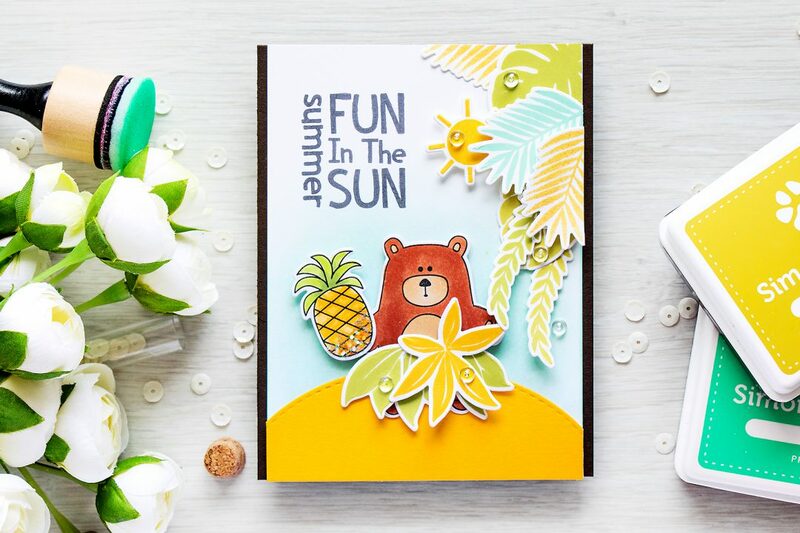 My island die cut was foam mounted onto the ink blended panel, I also stamped a Summer sentiment in Slate ink. The bear was foam mounted onto the panel, so was the pineapple. I also foam mounted the sun die cut and clustered a bunch of leaves around it to create the look of the tropics. Finally I adhered my panel onto a Chocolate card base and added clear droplets from Pretty Pink Posh to finish this card. I was laughing hard when saw this card. Such a funny idea! I like that the skirt leaves are a bit oversized for this bear. It makea it look even funnier. And you can tell it from his (her?) face expression! Really loved your Tropical Island card. I love watching you make cards. Thank you for sharing.